A city in Japan – and the site of one of the deadliest catastrophes in human history, namely the first use of an atomic bomb as an act of war (at the end of WWII) – and thus the name Hiroshima alone stands for man-made tragedy as much as otherwise perhaps only Auschwitz does. In fact, while at Auschwitz more people were killed over several years, the nuclear blast at Hiroshima killed more people in an instant than any other killing in history. And of course, many more died of the immediate and long-term after-effects. The city of Hiroshima has devoted itself to the promotion of peace ever since, and the sites one can visit here as a dark tourist rank amongst the world's best. More background info: Many guidebooks open their sections introducing Hiroshima by saying that "for the worst of reasons" Hiroshima needs no introduction. This holds particularly true for the dark tourist, of course. What makes Hiroshima so iconic is not just the sheer enormity of the human loss, it also signifies the human race's fall from grace as far as this entirely new level of using a weapon of mass destruction is concerned. It marked the beginning of the nuclear age, in which the "overkill" capacity of the subsequently amassed nuclear arsenals could have meant (and still could mean) the end of civilization at large if unleashed, as "a hundred thousand Hiroshimas" (i.e. in World War III). Conversely, the anti-nuclear arms peace movement promoted by the city under the motto "No more Hiroshimas" is on a par with the German call "Nie wieder Auschwitz" ('never again Auschwitz'). In fact, both words have become bywords for atrocities on a scale beyond comprehension. And both share a status as dark tourism sites not only of the very highest order, but also offering iconic structures of the most immediate recognizability: the ramp and gatehouse of Auschwitz-Birkenau and the A-Bomb Dome in Hiroshima (it's for this reason that both feature in this website's logo). They can be considered dark tourism's counterparts to "normal" tourism's most iconic structures/images, say the Eiffel Tower in Paris or the Pyramids of Giza. While Auschwitz and Hiroshima have in common that they were sites of "industrialized" mass murder, what distinguishes the two is this: Auschwitz was the culmination of the drawn-out crime that was the Holocaust, while Hiroshima was the starting gun for an altogether new development: the nuclear arms race which dominated the Cold War (even gave us it in the first place) and threatened civilization and humankind altogether. It has been argued, naturally in particular by the US military leadership, that on balance the use of the atom bomb saved more lives that it cost by bringing World War II to a quicker end, without the need for a bloody invasion of the Japanese mainland. But of course that argument is vacuous to all the innocent civilian victims who were vaporized in the blast – or were left to suffer from the after-effects, some of which persist to this day. Hiroshima was followed three days later by the second atomic bomb, which destroyed Nagasaki in a nuclear atrocity on a similar scale to Hiroshima's. But it is Hiroshima – the first victim of the atomic bomb – that has become the byword for nuclear atrocity. And a gauge for atomic disaster too. Modern nuclear warheads are still described as being "x times the power of the Hiroshima bomb". Even the biggest civilian nuclear disaster, Chernobyl, has been compared to the destruction of Hiroshima (although that was an altogether different scenario, of course). And even though the two atom bombs did facilitate getting the Japanese to finally surrender, the shock to the world has remained so deep that to this day no other nuclear device has been put to use again (outside test conditions, that is, of which there have been thousands since … occasionally still today, see North Korea). It has also been argued that it may have been the very fact that at Hiroshima the destructive power of the atom bomb was demonstrated "for real", i.e. in war, on a populated target, not as a mere test, that a) Stalin's USSR's expansionist moves at the end of WWII were kept in check, and b) the subsequent strategy of the nuclear deterrent actually worked for so long, all the way through the Cold War ... and – keep fingers crossed – in today's modern world of countless localized wars and terrorism. The whole historical account and debate of and around Hiroshima as well as the technical details of the atomic bombing go way beyond the scope of this website, and both have filled volumes already. So a shorter summary has to suffice. The principles and theoretical uses of nuclear fission were already well understood by the time of WWII – and for a while it was feared that even Nazi Germany may have been endeavouring to develop an atomic bomb (cf. Vemork). In the end, however, it was the USA who pumped enormous resources into the successful development of a nuclear weapon, a mission collectively known under its code name "Manhattan Project". On 16 July 1945 the first test of an atom bomb, "Trinity", was successfully conducted – a bomb of the design later used in the A-bombing of Nagasaki, namely a plutonium implosion bomb. The bomb to be dropped on Hiroshima, however, had not been tested prior to its use. It was a uranium bomb of the "gun-type" design. In this, two subcritical loads of uranium were shot into each other to initiate nuclear fission – the scientists were confident enough this simpler design would work. And anyway, there wouldn't have been enough enriched uranium available at the time for a second such bomb. The politics and strategic deliberations behind the decision to drop the bomb on Hiroshima are a complicated matter. It seems that the general decision to use this new kind of weapon against Japan – rather than in Europe – had long been in place. But before the first atom bomb's development was completed, WWII in Europe had, on 8 May 1945, ended anyway. Meanwhile the war in the Pacific raged on – especially bitterly at the battle of Okinawa, which had started in April and was dragging on for months, causing the highest casualties the US military ever sustained in any battle it had fought. Apparently, the Japanese were indeed determined to "fight to the last", and a land invasion of the Japanese homeland thus became an even more dreaded possibility. This is often taken to have been a particularly convincing argument in favour of using the bomb – to increase the pressure on Japan to surrender unconditionally. On the other hand, there have been arguments that Japan was on the brink of surrender anyway, and that conventional air raids could have been enough to exert sufficient pressure. Then there was also the role of the Soviet Union, and post-war politics between the West and the USSR were already getting difficult. Stalin had promised to join the war effort against Japan ... and eventually did indeed declare war on Japan, namely the day before Nagasaki! For the USA, however, a victory against Japan on their own, without having to accommodate the feared Red Tsar's wishes, offered a far more favourable outlook. So it is assumed that the USA wanted to combine the shock effect the bomb would have on Japan with the message it would send to the USSR, as a deterrent, as it were. This is also sometimes brought in as an argument as to why the US did not make do with a mere "warning shot" – i.e. detonating the device not over a city but over less populated or uninhabited Japanese territory. As far as Stalin was concerned, however, the full demonstration of the bomb's power over a city was the more effective warning. There was presumably also an independent desire amongst the designers of the bomb and military strategists to "test" and study the effects of the bomb "for real", under full war conditions, regardless of the civilian casualties that were to be expected. However, there were also critical voices, some from high-ranking figures, including some from within the Manhattan Project. In particular, the warning was voiced that if the USA were to be the first to use such a weapon it could ruin the country's reputation and at the same time initiate a nuclear arms race. At least the latter was evidently borne out to the full. It is sometimes also assumed (e.g. at Hiroshima's museum) that one motivation for dropping the bomb was justifying the USA’s enormous financial investment in the project. If it could be shown to deliver the desired effect and end the war, those costs could be better explained to the American people … On the other hand: given the fact that the Manhattan Project had been conducted with the utmost secrecy, this argument seems somewhat less than convincing – the people didn't yet know about those costs – and anyway, would military expenditure really have been made contingent on what the people considered appropriate? Whatever the exact motives for dropping the bomb may have been, there was still the concrete question of what target was to be selected. In fact, that discussion had long been going on, and a list of potential targets was drawn up by a Target Commission. This list included, alongside Hiroshima: Kokura, Niigata, Kyoto (later dropped from the list), and: Nagasaki. Part of the reasoning was that the target had to be of a large enough size ... to demonstrate maximum effect, but also for fear that aiming at a smaller target could mean failure if it were missed. Another factor was that there had to be no known POWs in the target city. For this reason it was also decided to use the bomb without any precise warning, as it was feared the Japanese might use POWs as human shields. The place had to be of some strategic value too, of course, although that was clearly not the main concern. Another aspect was that the target should not yet have been bombed conventionally, like e.g. Tokyo, which by August had been all but incinerated by air raids of a magnitude comparable to that of Dresden. In fact, once the list of targets was drafted those potential target areas were deliberately spared conventional bombing – so that the full "pure" effect of just the atomic bomb could be demonstrated and studied. Densely built-up Hiroshima had at the time ca. 350,000 inhabitants, had so far been unaffected by conventional bombing, was home to several important military installations and HQs, but had no POW camps. And its total area size was several miles across and it was also ringed by mountains, which was presumed to contribute to the effect of the bomb. Thus the city was the "ideal" target and put at the top of the list accordingly. The dropping of the bomb was a complicated manoeuvre and was being practised by specially assigned B-29 bomber aircrews. Practice dummies, called "pumpkins", were even dropped over Japan itself near the intended target areas in the run-up to the real bombing. The actual bombs were to be delivered from the Pacific island base of Tinian. At 8:15 a.m. the bomb was released and the "Enola Gay" made a sharp turn to avoid the shock wave. Less than a minute later the bomb ignited roughly 2000 feet (600m) above ground in a flash and a fireball formed. The wave of heat that instantly followed reached an estimated 4000-6000 degrees Celsius on the ground below. The initial flash burned "photographic" shadows of objects and even people onto surfaces. Everything within a radius of about 1-2 miles (2.5-3 km) around the hypocentre caught fire. Then the blast wave flattened everything apart from a few reinforced-concrete buildings. The majority of the city's buildings, however, were made of wood and were thus incinerated. Even further away spreading fires destroyed buildings. Roughly 95 % of the inner-city districts' structures were demolished, and about 70% of the whole of Hiroshima. The bomb itself also had a harmless-sounding name of its own: "Little Boy", allegedly chosen for the surprisingly small size of the device – compared to earlier design proposals – but still, it's not without some cynicism. It was supposed to deliver the equivalent of 20,000 tons of conventional TNT explosives. But it was later estimated that it had a yield of "only" 13-15 kilotons. Because of its comparatively crude "gun-type" design only a very small percentage of the bomb's uranium actually reached fission. The rest would have been pulverized and become part of the radioactive fallout. And as for the people … those close to the hypocentre were more or less vaporized or charred in an instant, and everyone exposed to the wave of heat directly within a larger radius was burned alive too. Many also died of the shock-wave blast – and in the debris of crushed buildings. Initial survivors, trudging out towards the suburbs badly burned, with skin and scorched clothes hanging off them, mostly died soon after. And even those who escaped lethal burns were still exposed to the radioactivity of the bomb. Soon after the initial tragedy, radiation sickness began to claim further lives. A particularly tragic element in all this horror was that the mushroom cloud that had formed over Hiroshima began to rain off – "black rain", the fallout from the bomb, i.e. full of radioactive material. Survivors on the ground desperate for drinking water drank this toxic sludge, making their radioactive contamination even worse. It's extremely difficult to arrive at any exact figures for the total number of casualties, as it isn't entirely clear how many people were in the city at the time of the bombing. Figures quoted with some regularity range between 70,000 and 80,000 killed instantly and about as many dying of the after-effects, mainly burns and radiation sickness. Late effects like radiation-induced cancers and genetic defects occur to this day. One particular type of injury was inflicted by the blast in the form of shattered glass from blown-out window panes – cases of victims who had to have shards of glass removed from their bodies occurred for decades after the event, in a few cases even quite recently. Three days after Hiroshima, a second bomb destroyed Nagasaki – and on 15 August Japan finally surrendered and WWII was over in the Pacific too. After the war, Hiroshima was reconstructed – like a phoenix rising out of the ashes, as is often said – and is now a modern and thriving city again. But the scars of 6 August remain, and so does the memory of this tragedy that changed the world forever. The complex of A-bomb-related sights in the city is also one of the most popular tourist destinations in Japan, receiving a larger number of visitors than most other dark sites in the world. Needless to say it is also one of the most tragic and thus darkest sites (esp. in conjunction with Nagasaki) – and this can be an emotionally very taxing place to visit. But it's wholly worthwhile. 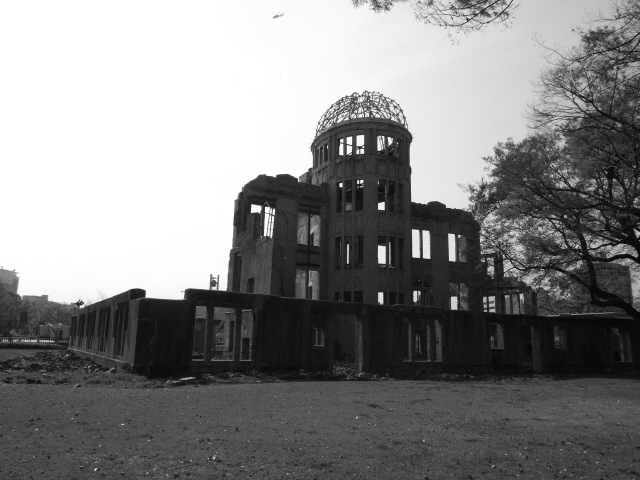 The A-Bomb Dome, the focal point of it all and obviously an absolute must! The Peace Memorial Park's countless memorials and monuments – including the "aiming point" of the bombing: the T-shaped Aioi Bridge, the Peace Bell, and the recently added Hiroshima National Peace Memorial Hall for the Atomic Bomb Victims. The Peace Memorial Museum, the main museum and centrepoint of the Peace Park; its expansive exhibitions are hugely engrossing though at times emotionally taxing. Not to be missed – and you have to allow plenty of time! Fukuro-machi Elementary School Peace Museum, much smaller, but worth it. Honkawa Elementary School Peace Museum, even smaller, in part quite endearing, but also definitely worth it. - The former Bank of Japan Hiroshima Branch building on Rijo-dori, the first main street east running north to south parallel to the Peace Park, just a short stroll away. This building was fenced off and appeared partly boarded up at the time of my visit (April 2009), but it will probably have reopened for some kind of (tourist?) use again by now. - The former Imperial Bank building on a corner of the covered pedestrianized Hondori shopping street. The building now houses a shop (Andersen), but a small plaque by the entrance marks it and gives some brief information. - The former old City Hall building's basement room (all that remains of the original building today) south of the Peace Boulevard along Rijo-dori. It houses a small exhibition primarily about the relief efforts after the bombing. - The Fukuya department store on Aioi-dori (still a department store). - Hiroshima Castle to the north of Aioi-dori. The castle served as the military HQ in Hiroshima at the time of the bombing and was destroyed by the bomb but later faithfully reconstructed. - The former Army Clothing Depot, of which two warehouse buildings still exist, at 2-4-60 Deshio, Minami-ku. Their dented iron shutters give a good indication of the power of the A-bomb's blast even this far, nearly 1.8 miles (2.8 km), from the hypocentre. It's a bit of a trek, but worth seeking out. To get there take any tram going down Rijo-dori southwards, e.g. from the Hondori stop; stay on the tram until it crosses the river, then get off at the first stop after the bridge; from here it's a good 10 minutes' walk: while the tram turns off to the right you carry on straight until you come to the next major intersection, cross and turn left now heading roughly north, then take the second side street branching off to the right and you should see the old red-brick buildings with their dented shutters. One to the left, the other straight ahead. The buildings are currently not accessible to the public (their future use is under discussion), so you can only take a look from the outside. Still, worth it if you have the extra time. Finally, there's a rather small and inconspicuous looking marker stone at the spot which was the hypocentre of the atomic explosion, i.e. directly underneath where the fireball initially started – see under A-Bomb Dome (>combinations). Location: on the south coast in the westernmost part of Japan's main island of Honshu, about 420 miles (680 km) from Tokyo. Access & costs: fairly easy from within Japan, sites in the city are mostly easy to reach on foot and either free or very cheap. Details: Japan has an excellent public transport network, especially the fabled high-speed Shinkansen "bullet-train" links – and these take only 4-5 hours from Tokyo, which more or less makes internal flights superfluous (though they are offered too). Single train fares are expensive, but most visitors to Japan will use JR rail passes, which make a good saving on a return trip from Tokyo to Hiroshima alone. Within Hiroshima cheap trams and buses operate, but the sites of (and around) the Peace Memorial Park are all walkable. Admission fees are negligible where they are charged at all. There's a wide range of hotels in Hiroshima, from budget to luxury. A couple of hotels are very near the Peace Park, even overlook it. Out of these, the affordable Sunroute Hotel Hiroshima is best equipped for foreign guests. It's located directly by the river on the opposite bank just a hundred yards or so from the bottom of the Peace Park complex and the museum, and if you're lucky you may have a room directly overlooking the Peace Park and the A-Bomb Dome in the distance. (I wasn't so lucky, but you get the full view from the breakfast room on the top floor as well, making the breakfast option doubly worth the extra cost). Time required: Some guidebooks say you can do Hiroshima's A-bomb-related sights easily in about a day – but I struggled, even though I had a day and a half, and felt I had to rush to get it all in before my time ran out. The main Peace Museum alone can easily take up at least half a day. And cramming all the rest into a single afternoon is pushing it. If you want to have time for everything and time for a bit of contemplation too, then do allow more time, two days at least plus perhaps a little extra for other activities. Combinations with other dark destinations: in general see Japan – it's almost too obvious to even mention it, but if you've come as far as Hiroshima, then you almost have to go to Nagasaki as well. In fact, Nagasaki has what in my view is on balance the slightly better museum, though it lacks the iconicity of a sight like the A-Bomb Dome. Chronologically and in the scale of the death toll (despite the slightly more powerful bomb), Nagasaki may have come second to Hiroshima – but in a way it's the even more tragic story. Combinations with non-dark destinations: the city of Hiroshima is, perhaps surprisingly, a very pleasant, open, friendly and almost cosmopolitan place, with wide boulevards, good shopping, and an exceptionally rich nightlife … allegedly there are some 4000 bars in the city! Extremely interesting culinary specialities beckon too – such as okonomiyaki, a very tasty concoction of a pancake-like base made with fried soba noodles and shredded cabbage smothered with sauce and finished with a choice of toppings (hence it's sometimes misleadingly referred to as "Japanese pizza"). There's a whole "temple" that is devoted to this local speciality and aptly called Okonomi Mura ('okonomiyaki-village') at 5-13 Shintenchi, Naka-ku, in central Hiroshima. It consists of dozens of stalls all making okonomiyaki (in slightly different ways) spread out over three levels, from the second to fourth floor, inside a crammed and noisy building. Even if you don't want to try the food (but you should!) it's quite a sight to behold in its own right. An online guide that might make choosing a place out of the huge range a little bit easier is available here. Hiroshima's pleasant city-ness is thus well worth exploring for an extra day or so, i.e. in addition to those dark sights … even if these, let's be honest, are and will always be the main reason for any tourist to come here in the first place. Outside Hiroshima itself, there's one other premier tourist sight nearby that is often said to be a must, without which a visit to Hiroshima would be incomplete (I gave it a miss all the same, though). It's the exceptionally scenic Miyajima island with its famous great "floating" Torii gate standing in the water in the bay in front of the island's grand shrine. This Torii seems to be second only to Mt Fuji as an iconic image standing for the whole of Japan. It features in virtually every tourist brochure about the country. When travelling from Tokyo (which is most likely), then a stopover roughly halfway in Kyoto (and/or Osaka) would be a typical item on most itineraries, as will a visit to Japan's most significant castle at Himeji, which is located some 60 miles (100 km) west of Osaka en route to Hiroshima.